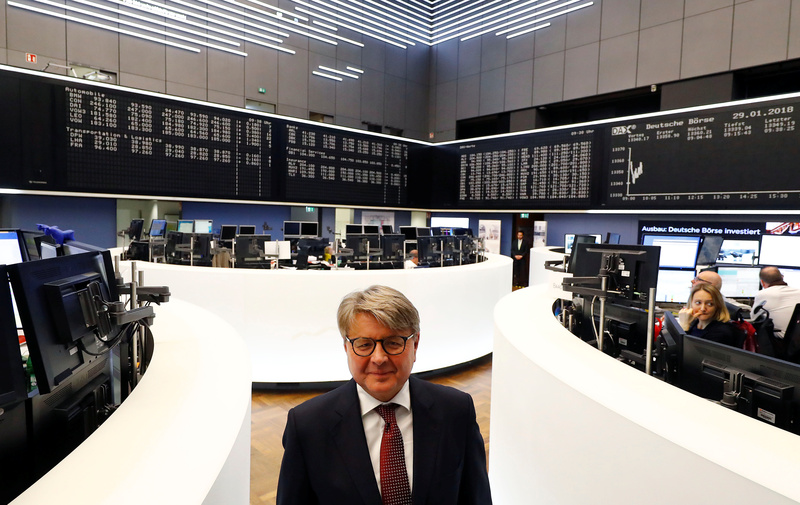 Theodor Weimer, new CEO of German stock exchange Deutsche Boerse AG, waits for his speech to inform the media about the planned renovations at the trading floor of Frankfurt's stock exchange in Frankfurt, Germany, January 29, 2018. German stock exchange operator Deutsche Boerse said on April 11 that it is in “concrete negotiations” with Refinitiv about the potential acquisition of certain of the data provider’s foreign exchange business units. The statement came after Reuters reported on April 10 that Deutsche Boerse was in talks to buy FXall, a foreign exchange electronic trading platform owned by Refinitiv, citing people familiar with the matter. “The negotiations and assessments of a potential transaction are ongoing,” Deutsche Boerse said in a statement. However, it added that "the purchase price of $3.5 billion and the imminent signing of binding contracts mentioned in the market speculations are entirely unfounded". Selling the platform would help Refinitiv trim its debt pile following its acquisition last year by a consortium led by Blackstone Group in a $20 billion leveraged buyout. Thomson Reuters, the parent company of Reuters Breakingviews, owns 45 percent of Refinitiv. Deutsche Boerse shares were down 0.1 percent at 115 euros at 0900 GMT on April 11.